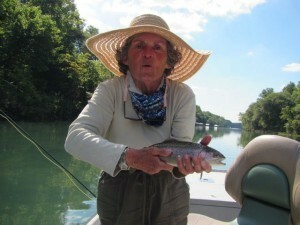 Jean Latta fished with us two years ago in route to her new home in State College, Pennsylvania. She showed up here again last Thursday and is currently fly fishing her way back across America to another new home now in Los Angeles, California. She is nicknamed “The Bamboo Lady” because she loves to fish split cane rods. 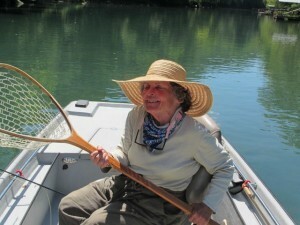 Jean is well traveled and is quite simply a very good fly fisher. It is just a joy to spend a day on the river with her. We had a wonderful day and caught a bunch of feisty Rainbows and one little year old Brown Trout. The fly of the day was sort of like the bamboo rods, an old standby, the White River Sowbug in a size #16. If you ever get a chance to fish with Jean do not pass up the opportunity. You will have a great time and you will definitely learn a lot! Sure hope she decides to move again so she come back and fly fish with us.